Do you like sushi? I love it. Buying it is quite pricey and making sushi takes quite a lot of time. So I’ve come up with a great, super fast and very healthy alternative. Cut the lettuce and the tomatoes any way you like them. Cut the salmon in thin slices, you’ll need a good knife to do this. 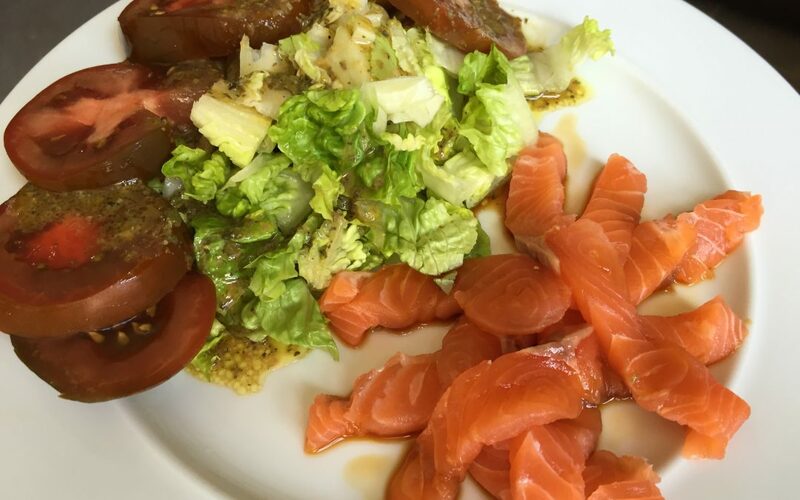 Arrange everything on your plate, pour some salad dressing on the salad and the soy sauce on the salmon and enjoy! Organic salmon is a healthy source of protein and fat including Omega 3 fatty acids which are important for brain and heart health. Omega 3 also helps regulate cholesterol and triglyceride levels. Research on Omega 3 levels in children have shown that it can boost cognitive capacity and be beneficial for children with ADHD. This tip works if you have a good supermarket near where you work. Prepare your lettuce and tomatoes in a suitable lunch box, take the salad dressing and soy sauce in separate containers. Safely pack a good knife. At lunch time go to the supermarket to buy your fresh piece of salmon, cut it and add it to the other ingredients, et voilà, you have a quick, healthy lunch. If you like this recipe, check out my other recipe ideas here or join our amazing community and discover inspiring stories that may change your life.